Now here was an unusual dining experience for Gina and the Big Dog. The food was merely serviceable, the view was disappointing, the decor drab, the service pedestrian, but we’ll look fondly back on the experience itself because of the two delightful strangers who were seated at our table by chance. We made reservations on the Cape Cod Central “Gourmet Lunch Train” a week before our Wednesday excursion, and didn’t know what to expect. Arriving in downtown Hyannis as instructed, 45 minutes before our 11:30 a.m. boarding time, we imagined being seated with the pack of unruly urchins in matching fluorescent tee-shirts, or worse, with any of the numerous pairs of frail grandmas being hauled around by their hipster granddaughters. Instead, after some confusion, we were led to the first table in the Great Island car, seated opposite Phil and Betty Rae, a retired couple who summer on the Cape and winter in northern Florida and who we’re pretty sure are the most pleasant people on the East Coast. While the train chugged through an endless tunnel of bittersweet and ferns, we heard about the couple’s interesting children. While we chewed chicken breast in an egg wash topped with a lemony supreme sauce, a couple of roasted potatoes, and three outstanding asparagus spears, we learned about the couple’s own interesting careers. We heard about Little Dogs and how difficult they can be, and the Big Dog offered some guidance for an upcoming visit by Li’l Dog. We enjoyed the seafood chowder. We’re not sure you can call a lunch “gourmet” and serve only chicken breast with supreme sauce, but the chicken was good and the potatoes were too. 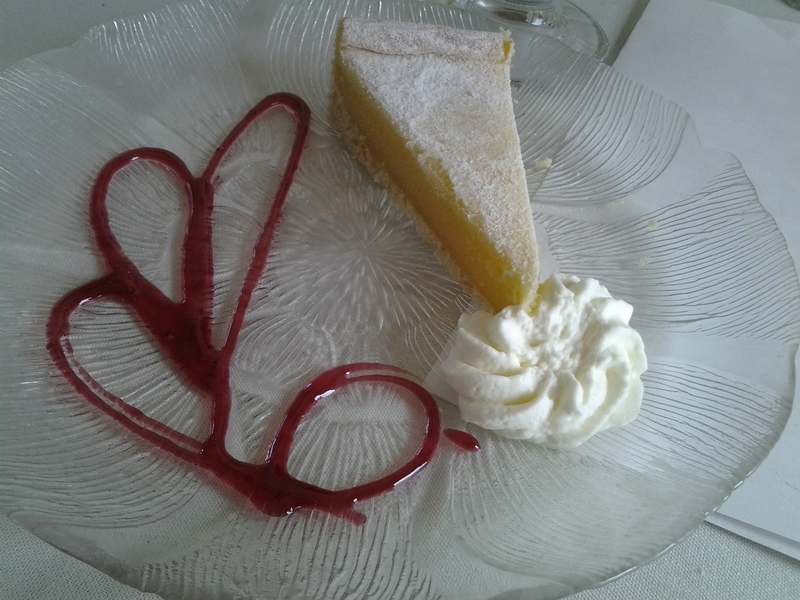 The day’s dessert was a lemon tart with raspberry sauce, and that was good. The coffee was good. We enjoyed a couple of glasses of cabernet with our lunch. Our waitress was cheerful and had really good balance, enabling her to haul a tray full of beverages while the train was in motion. Looking at a map, you’ll imagine views of the bay, quaint villages, and the majestic Cape Cod Canal. The urchins and many of the grandmas turned out to be in a different non-lunch “Scenic Train Ride” car, along only for the scenery, and we’re certain they were extremely disappointed, because the view is obscured throughout. The sound system played an entertaining selection of rail-related music, but then deteriorated into static. A narrator offered some commentary on the ride back, but we were talking and not paying attention. So while our servers had to deal with some lurching issues that your normal waitstaff does not, every passenger in the car had the same chowder-chicken-tart order; this was not a service challenge. Presumably, a significant portion of the $45 per person charge is for the train ride. And yet our bill included this off-putting line: If you are happy with your service, we suggest you base your gratuity on 18%-20% of the GRAND total of your bill. We like to think of our dining-out experiences in terms of the overall value, and that statement on the bill suggests that our fee was for lunch service delivered by our waitstaff. If this was a $45 lunch in a train car with a view, it was a horrific rip-off. And had we been seated with the urchins or Grandma/Hipsters, that would have been our take-away: horrific rip-off. But the fact is that we enjoyed lunch immensely. If the Cape Cod Central Railroad had something to do with us being paired with the nicest couple on the East Coast, then bravo. We’ll leave it at that. This entry was posted on August 15, 2013, 10:21 pm and is filed under Dining with a Great View, Restaurant Review. You can follow any responses to this entry through RSS 2.0. You can leave a response, or trackback from your own site.